You’d be forgiven if you thought trekking in Peru was all about the Inca Trail. And whilst it’s an obvious choice, there are much better ways to discover the glory of Peruvian Andes on foot, away from the crowds and well off the beaten track. The variety of trails in Peru is pretty immense and often considered to include some of the best trekking in the world. From 5000+ metre snow-capped peaks (or cordillera’s) and glaciers to cloud forests, canyons and dry plateaus. Lost civilisations have built their cities and settlements in the Andes – some have been discovered, while others still remain hidden in the jungle (probably). The two main trekking hubs are Huaraz in the north, and the gateway to the exceptional Cordillera Blanca, and the ancient Inca city of Cusco in the south, the starting point for most trails toward Machu Picchu. The Alpamayo Circuit has often been ranked as one of the most spectacular treks in the world. And it’s no wonder. On this ten-day trek, you’ll traverse around the unique, pyramid-shaped Alpamayo (5947m), crossing high and windy passes, past snow-capped mountains, massive glaciers and through verdant green valleys. Set in the Cordillera Blanca, and starting in the mountain town of Huaraz, this challenging trek is brimmed to the rafters with ancient Andean trails, pre-Incan ruins, and friendly Quechuan communities. On day seven, you’ll get to see Alpamayo up close and personal as you climb up to the old basecamp, with awesome views of 5000m+ peaks, including Huascaran (6768m), the highest point in Peru, Mount Taulliraju (5830m) and Mount Rinrijirca (5808m). The trail can be tough; it’s remote location, challenging passes and extreme high altitude mean its best tackled with a local guide. Fluctuating between 3650 and 4780 metres, you will need to take time to acclimatise. The path can be difficult to find at times, it is truly off the beaten track, having an experienced guide will take a lot of that pain away. On this gruelling ten to twelve multi-day trek, you’ll circumnavigate the cluster of stunning mountains that make up the Cordillera Huayhuash, south of the Cordillera Blanca. The trail leads you over numerous high passes, the highest two being over 5000 metres, and the rest rarely dipping below 4000 metres. Its extreme remoteness takes you through some of the most sparsely inhabited parts of the Andes, it’ll definitely test your endurance to the limit, we’re not going to lie, it’s a toughy. En route you’ll encounter remote mountain vistas, turquoise lakes, towering peaks, knife-edge ridges and hand-carved passes chipped into the rocks. Some of the highlights include catching a glimpse of Yerupajá (6635m), Peru’s second highest mountain, and the Siula Grande (6344m), the real-life location behind Joe Simpson’s ‘Touching the Void’. This remote trail has minimal facilities. The few camp areas are managed by local communities and are very basic, you may well need to wash in the streams and lakes that pepper the landscape. Due to the exceptionally high altitude, with a couple of very long days, the trek is considered to be very difficult. Its elevation and isolated setting mean that it’s not only tough to evacuate, but you must, must take time to acclimatise. Falling foul of altitude sickness here is not a good idea. Going with an experienced and local guide will not only keep you safe, but show you sections, and tell you stories that you wouldn’t experience otherwise. The Santa Cruz Trek is probably one of the more famous trails in the Cordillera Blanca, and therefore it can get a little crowded, particularly in peak season (May to September – the dry season). However, compared to some of the other routes in the area it is far more accessible. The trek takes only four days to complete, covering around 50 km, and it doesn’t include the volumes of high-passes that you get elsewhere. Located in the Huascarán National Park, the most common place to start from is La Vaqueria. As you wind through the ancient Inca roads of the Cordillera Blancas, you’ll navigate the Punta Union (the highest section of trail at 4759 metres), pass by the as blue-as-you-like Ichiccocha and Jatuncocha Lakes (Big and Small Lake in Quechua), and get a stonking vantage point of Huarascan (6768m), and the Alpamayo (5947m). Compared to most, the trail is well-marked and can be done without a guide. But, as with all Peruvian hikes, the altitude and solitude make it risky. You’ll also need a permit, and working with a local guide can not only get that for you, but you’ll also get more help carrying your pack. If you only have limited time in Peru, the Santa Cruz Trek is the perfect choice, both for its diversity and brevity, but be prepared to bump into a few other folks with the same intentions. Okay, a bit of a wild card throwing a mountain into the mix, but hear us out. 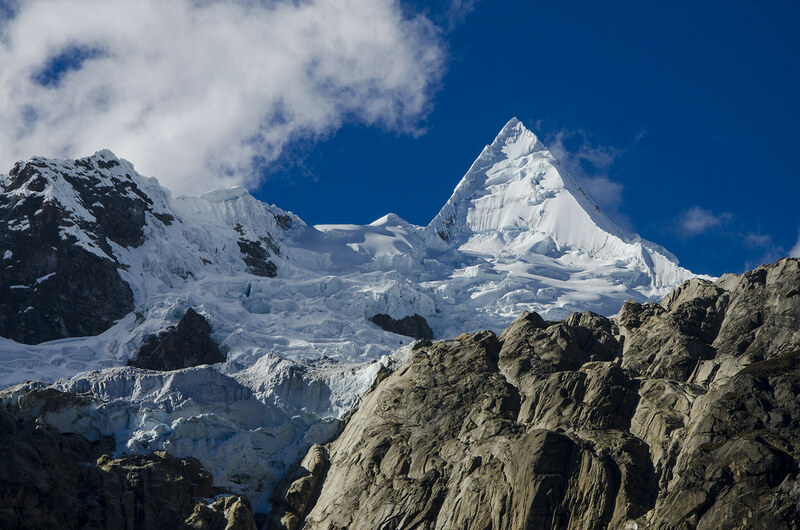 Mount Pisco (5752m), named after the Peruvian drink celebrated with on the first ascent, is situated 60km north of Huaraz and sits at the heart of the Cordillera Blanca. It is considered to be the easiest peak to climb in the range and is often used for acclimatisation before ascending one of its loftier neighbours above 6000 metres. Even though labelled an easy peak, Pisco is still remarkably high, and you still need to be mindful of the altitude and risks that go with it. Having said that, the climb in not-technical, especially via the west face, however, large sections of ice have melted in the past, making the so-called easier routes, not so easy. You’ll still need to don crampons, ropes and ice-axes for the glacier sections. From the top, you get glorious 360-degree panoramic views of the surrounding peaks including Mount Huandoy (6395m), Chopicalqui (6354m), Chacraraju (6108m), Artesonraju (6025m) and both summits of Huascaran. Typically done in three days, you definitely need a guide to conquer Pisco. The weather is prone to dramatic changes, and they can get you up and down safely, ensure you’re acclimatised to lower the risk of altitude sickness and provide and teach you how to use the equipment needed for those more techy sections. The big trek that everyone thinks about when you mention Peru, is, of course, the Inca Trail. Located in the mountains around the ancient city of Cusco, in the Sacred Valley, this classic route can be very over-crowded, so much so that the number of visitors has been capped. Of course, the absolute highlight is reaching Machu Picchu, the 15th-century Inca citadel set in the middle of the Peruvian Jungle. But there is another way. The Salkantay Trek. Voted one of the best 25 treks in the world by National Geographic, the Salkantay route takes you on a spellbinding journey beneath the magnificent Salkantay (6271m), meaning ‘Savage Mountain’ in Quechua. You’ll pass through rainforest, cloud forest, highlands and high mountain passes, beneath glaciers, around turquoise lakes, and past three of the most stunning peaks of the Cordillera Vilcabamba mountain range, before reaching the famous Machu Picchu. There’s definitely something magical about exploring Machu Picchu at sunrise before the day visitors arrive. The Salkantay trek is a great challenge for those looking to explore the most iconic parts of Peru, off the beaten track. The steep terrain and altitude will make the going tough at times, but anyone with good fitness and a can-do attitude shouldn’t have any issues. Unlike the Inca Trail, where you’ll need to book permits up to six months advance, the Salkantay route has no permit limitations, so you can afford to be a bit more spontaneous. The other option is the nine-day Choquequirao Trek. This tough and steep route joins up with the Salkantay Trek before reaching Machu Picchu. Fancy your own adventure in the Peruvian Andes? Check out our entire collection of trekking holidays in Peru, and other Peruvian adventures. PreviousThe Annapurna Sanctuary Trek or the Annapurna Circuit | Which Should You Choose?